The Smart ForTwo packs a lot of punch for a small car. It’s an Ultra-Low Emission Vehicle (ULEV) that gets 41mpg, fits into the tightest parking spaces, and has leg room and head room equivalent to luxury models such as the Mercedes-Benz E-class. Choose from 3 smart brands – Pure, Passion Coupe, Passion Cabriolet. 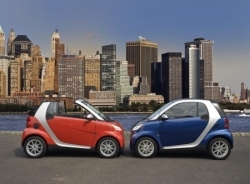 SmartUSA.com, Starts at $11,590.